This part of ISO 14689 relates to the identification and description of rock material and mass on the basis of mineralogical composition, genetic aspects, structure, grain size, discontinuities and other parameters. It also provides rules for the description of other characteristics as well as for their designation. This part of ISO 14689 applies to the description of rock for geotechnics and engineering geology in civil engineering. The description is carried out on cores and other samples of natural rock and on rock masses. – Part 2: Electronic exchange of data on identification and description of rock. This part of ISO 14689 covers areas in the international field that were never previously standardized. It is intended that this document presents broad good practice throughout the world and significant differences with national documents are not anticipated. A more detailed description of rock and related to the site and project is likely to be appropriate. This document is based on international practice (see the Bibliography). Rock mass classification systems using one or more descriptive parameters to suggest likely rock mass behaviour are beyond the scope of this part of ISO 14689 (see Bibliography). Identification and classification of soil for engineering purposes is covered in ISO 14688-1 and ISO 14688-2. NOTE Additional terms and definitions are given in EN 12670. NOTE Common examples are given in Table A.1. NOTE In sedimentary rocks, fabric is the orientation (or lack of it) in space of the elements (discrete particles, crystals, cement) comprising the rock. The term is used in igneous and other crystalline rocks for the patterns produced by non- uniform arrangements of grains, crystals and matrix. EXAMPLES Bedding plane, joint, fissure, cleavage and fault in rock mass. secondary voids (e.g. solution voids). NOTE Lithological identification of rock is necessary to appreciate the geology of an area, to correlate geological profiles seen in boreholes or to distinguish boulders from bedrock. It is also important when rock material is required for construction purposes. Engineering properties can only partially be inferred from the identification of rock type. The names of the more common rock types are given in Table A.1, which presents an aid to rock identification for engineering purposes. Rock names are given particular combinations of features in this subclause and correct naming requires recognition of the attributes listed. The rock shall be correctly identified within geological science. Geological maps related to the project shall be used for the designation of rocks. Rock material colour may be described using Colour Charts of an approved type. As an alternative, the following simple system should be used, which serves to limit the subjectivity of an estimation. One term is selected as required from each column (see Table 1) and combined as a colour assessment. Examples of use are: yellow, light yellowish brown, dark reddish brown, dark brown, etc. If necessary, colour differences can be emphasised separately by the use of terms such as spotted, dappled, mottled, streaked; for example, light yellowish brown spotted with dark brown. A descriptive scheme is given in Table A.1. Grain size refers to the average dimension of the predominant mineral or rock fragments comprising the rock material. It is usually sufficient to estimate the size by eye, which may be aided by a hand lens in the assessment of fine-grained or amorphous rocks, but separate descriptions of the grains and the matrix may be appropriate. The particle size and the mineralogical composition of the matrix shall be determined. Mineralogical composition shall be described using the terms given in Table A.1 (siliceous, calcareous, carbonaceous, etc.) but may be amplified, as appropriate, with such standard geological terms as ferruginous, argillaceous (containing clay minerals), quartzose and others. Discoloured The colour of the original fresh rock material is changed and is evidence of weathering/alteration. The degree of change from the original colour should be indicated. If the colour change is confined to particular mineral constituents, this should be mentioned. Disintegrated The rock material is broken up by physical weathering, so that bonding between grains is lost and the rock is weathered/altered towards the condition of a soil in which the original material fabric is still intact. The rock material is friable but the mineral grains are not decomposed. Decomposed The rock material is weathered by the chemical alteration of the mineral grains to the condition of a soil in which the original material fabric is still intact; some or all of the mineral grains are decomposed. The weathering terms given in Table 2 may be subdivided using qualifying terms, for example “partially discoloured”, “wholly discoloured” and “slightly discoloured”, as this will aid the description of the material being examined. The last three terms may be used in combination, for example, “wholly discoloured and slightly decomposed”. c) highly calcareous (++) if the addition of HCl produces strong and sustained effervescence. It should be noted that, in wet or moist rocks, the effervescence usually occurs with some delay. The degradation of rock material when it is exposed to a new water or atmospheric environment should be assessed where the relevant conditions shall be determined (see Table 3). Its behaviour when exposed to water should be described using the terms in Table 4, together with a description of the test undertaken. Some weak rocks do not show disintegration in water straight away, but only after being dried. The unconfined compressive strength of rock material can be estimated according to Table 5.
a Some extremely weak rocks will behave as soils and should be described as soils according to ISO 14688-1. NOTE Unconfined compressive strength cannot always be defined in the field, thus point load tests are often used as indices for strength of rock material. Any report describing compressive strength tests shall mention the specimen size, the test procedure, the anisotropy of the specimen and its water content. The structure of the rock mass should be described with relation to the larger scale interrelations of geological features and the associations between rock types in the mass. Examples of common terms which may be used and which are defined in standard geological practice are as follows (see Table 6). The tensile or shear strength across or along the surface is lower than that of the intact rock material. They have many modes of origin, for example, bedding planes, joints, shears, faults, cleavages or foliations and may occur locally in sets of relatively uniform characteristics or individually. In addition to describing the type of discontinuities, their orientations, spacing, persistence, roughness, aperture and filling, and seepage characteristics, the number of sets and the rock block size resulting from their combination should be recorded. It may often be necessary to describe large or important discontinuities individually. Full information on rock mass discontinuities can only be obtained from suitable exposures of the rock mass. 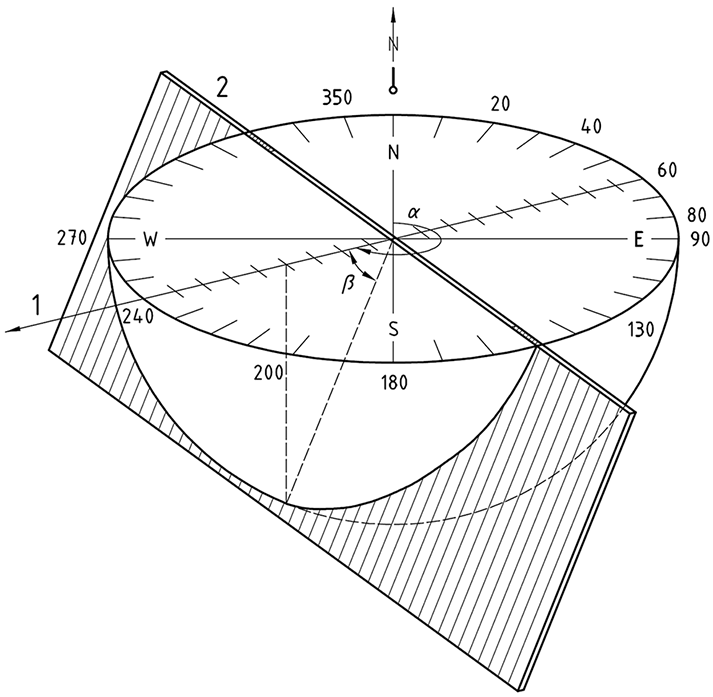 The maximum declination (dip) of the mean plane of the discontinuity is measured with the clinometer, and should be expressed in degrees as a two digit number, e.g. 50 (00 to 90). The azimuth of the dip (dip direction) is measured in degrees counted clockwise from true north, and expressed as a three digit number, e.g. 240 (000 to 360). The dip direction and dip should be recorded in that order, with the three digit and two digit numbers separated by a slash, e.g. 240/50. The pair of numbers represents the dip vector. The relationship between dip, strike and dip direction is given in Figure 1. The term “spacing” refers to the mean or modal spacing of a set of discontinuities and is the perpendicular distance between adjacent discontinuities. The terms to be used to describe bedding thickness are given in Table 7 and discontinuity spacing in Table 8. In drilled cores, it is usually difficult to measure the true discontinuity spacing: measurements are commonly made along the core axis. The method of measurement shall be reported. Discontinuity spacing in three dimensions should be described with reference to the size and shape of rock blocks bounded by the discontinuities. For the rock block size, the following scheme should be used (see Table 9). 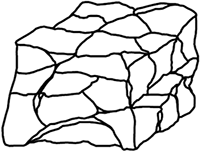 The rock block shape should be described according to the terms in Table 10. The rock block shape shall be correlated to the spacing of discontinuities. a) Polyhedral blocks Irregular discontinuities without arrangement into distinct sets, and of small persistence. b) Tabular blocks One dominant set of parallel discontinuities (1), for example bedding planes, with other non-continuous joints; thickness of blocks much less than length or width. 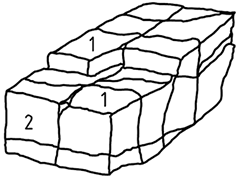 c) Prismatic blocks Two dominant sets of discontinuities (1 and 2), approximately orthogonal and parallel, with a third irregular set; thickness of blocks much less than length or width. d) Equidimensional blocks Three dominant sets of discontinuities (1, 2 and 3), approximately orthogonal, with occasional irregular joints, giving equidimensional blocks. e) Rhomboidal blocks Three (ore more) dominant, mutually oblique, sets of joints (1, 2 and 3), giving oblique-shaped, equidimensional blocks. 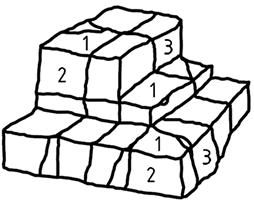 f) Columnar blocks Several, usually more than three, sets of continuous, parallel joints (1, 2, 3, 4, 5) usually crossed by irregular joints; length much greater than other dimensions. The linear extent of discontinuities from their inception to their termination in solid rock mass or against other discontinuities has to be measured in metres. The size of the exposure shall be recorded and, if possible and appropriate, measurements should be made in two or preferably three orthogonal directions. and using terms as indicated in Figure 2. A discontinuity surface could thus be described combining large or medium and small scale terms to give descriptions such as “stepped smooth” or “planar rough”. For total clarity of description, it may be necessary to give wavelength and amplitude measurements of the larger scale features. Note that all “smooth” discontinuities may be slickensided. Slickensides are striations on a discontinuity surface as a consequence of movement and pressure. Slickensided surfaces may be polished and reflect light. “Slickensided” should only be used with clear evidence of shear displacement along the discontinuity. The vertical and horizontal scales are equal. The perpendicular distance between the two surfaces of a discontinuity is referred to as the aperture. The origin of the exposure, such as natural outcrop, artificial excavated surface, etc., shall be reported. The separation has to be described using the terms in Table 11. The infilling material between discontinuity surfaces shall be identified and described (e. g. soil, minerals such as calcite quartz, epidote, chlorite clay gouge or breccia). The shear strength of infilling and the potential for infilling to swell shall be described, when relevant. Free moisture or water flow visible at individual spots or from discontinuities should be described using the terms “moisture on rock surface” and “dripping water” respectively. If the rate of flow can be estimated or measured then the rate of flow may be described using the terms given in Table 12. The weathering of the rock mass should be described in terms of the distribution and relative proportions of fresh rock and discoloured, decomposed or disintegrated rock, and the effects of weathering on discontinuities. Weathering eventually converts rock to a soil and the weathering profile shall be described in terms of three basic units: rock, rock-and-soil, soil. To subdivide the different weathering units, a scale with six distinct grades applicable to a profile in rock is given in Table 13. Table 13 gives a typical classification which is unlikely to apply to all rock types. More specific local classifications may be available and can be used where they are useful and unambiguous. In logging cores, the distribution of weathering grades of rock material may be recorded; distribution of weathering grades of the rock mass from which the cores were obtained has to be inferred from this type of evidence. Distribution of weathering grades in a rock mass may be determined by mapping natural and artificial exposures. It should be borne in mind, however, that isolated natural exposures of rock and excavations of limited extent are not necessarily representative of the whole rock mass. The rock mass permeability shall be measured by appropriate tests (e.g. pump test, Lugeon test). Symbols according to ISO 710-1 to ISO 710-7 shall be used to represent rocks on borehole legends or on engineering geological maps. key of symbols and terms used. If investigation results are recorded electronically, data should be transferred using open data transfer systems, such as XML (extensible mark-up language). The purpose of Table A.1 is to provide the engineer, with limited geological knowledge, a means of assigning a rock a name, which may not be strictly correct geologically, but should place the rock within a rock family and thus aid the identification of engineering problems associated with that family. Rock names are mainly selected from those used in non-specialist geological text books, and are not used strictly but as a general term for a wide group of related rock types. The rock to be identified is best seen in outcrop or as a large fragment showing broken surfaces. In using Table A.1, the first step is to decide whether the rock is igneous, sedimentary or metamorphic. Igneous and metamorphic rocks are crystalline; crystal surfaces reflect light, some crystals show geometric forms. Usually igneous rocks show no sharp layer boundaries and are massive. Metamorphic rock usually show layering, often bounded by wavy surfaces and are described as “foliated”. Clastic or detrital sedimentary rocks are, mostly composed of mineral grains cemented together and show “bedding planes” marking the boundaries between sediment layers. Pores between grains may be filled with cement or may be open; in which case the rock is porous. Some sedimentary rocks, such as the evaporites and some limestones, may be crystalline. However, the evaporites such as gypsum and rock salt are easily scratched with a fingernail, while the mineral calcite, of which most limestones are formed, can be scratched with a knife and gives off gas bubbles if dilute hydrochloric acid is applied to it. Sedimentary rocks may contain fossils. Once a rock has been placed into one of the three main categories then predominant grain size will help determine the name. The 63 mm boundary between coarse and very coarse grain size, and the 2 mm boundary between medium and coarse grain size are easily recognized by eye. The grains in rocks of less than 0,063 mm grain size cannot be seen clearly even with the aid of a normal hand lens. Distinctions between igneous rocks are partly based on quartz and feldspar content. Quartz- and feldspar-rich rocks tend to be light in colour while quartz- and feldspar-poor rocks are dark. Some distinctions are difficult. The names “mudstone” and “shale” in the fine grained clastic sedimentary rocks are used in Table A.1 to distinguish between rocks with bedding planes at more than about 6 mm spacing (mudstone) and less than about 6 mm spacing (shale). Bedding planes in shale may divide the rock into lenticular shaped pieces. Slate is also fine grained but the slate used for roofing has very closely spaced parallel foliation planes. Slate is usually a strong, tough rock. Both shales and slates may give severe engineering problems because they split easily and are very anisotropic. DEERE, D.U. (1963): Technical description of rock cores for engineering purposes. — Rock. Mech. Eng. Geol., 1, pp. 18-22. DEERE, D.U. (1968): Geological considerations. — In Stagg, K.G. & Zienkiewicz, O.C. (Eds. ): Rock mechanics in engineering practice, John Wiley Sons. HOEK, E. and BROWN, E.T. (1980): Underground excavations in rock. — The Instiution of Mining and Metallurgy, London. FOLK, R.L. 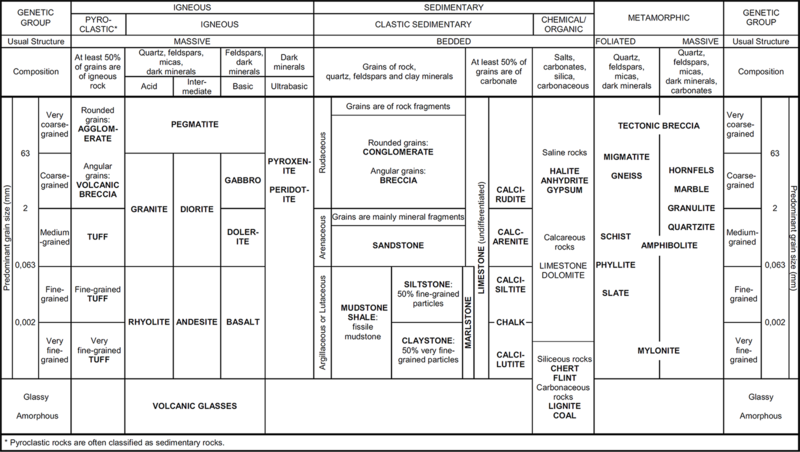 (1959): Practical petrographic classification of limestones. — AAPG (Amer. Assoc. of Petrol. Geologists) Bull., KV 43, pp. 1-38. IAEG (1981): Rock and Soil Description and Classification for Engineering Geological Mapping. — Bulletin of the International Association of Engineering Geology, No. 24, pp. 235-274. ISRM (1977a): Suggested Method for Petrographic Description of Rocks. — Int. J. Rock Mech. Min. Sci. & Geomech. Abstr. Vol.15, pp.41-45. ISRM (1977b): Suggested Methods for the Quantitative Description of Discontinuities in Rock Masses. — Int. J. Rock Mech. Min. Sci. & Geomech. Abstr. Vol. 15, pp. 319-368. ISRM (1978): Suggested Methods for Determining the Uniaxial Compressive Strength and Deformability of Rock Materials. — Int. J. Rock Mech. Min. Sci. & Geomech. Abstr. Vol. 16, pp. 135-140. ISRM (1980): Basic Geotechnical Description of Rock Masses. — Int. J. Rock Mech. Min. Sci. & Geomech. Abstr. Vol. 18, pp. 85-110. ISRM (1984): Suggested Method for Determining Point Load Strength. — Int. J. Rock Mech. Min. Sci. & Geomech. Abstr. Vol. 22, No. 2, pp. 51-60. ISRM (1996): Commission on Rock grouting, Final Report. — J. Rock Mech. Min. Sci, Vol 33, Nr. 8, Pergamon Press. 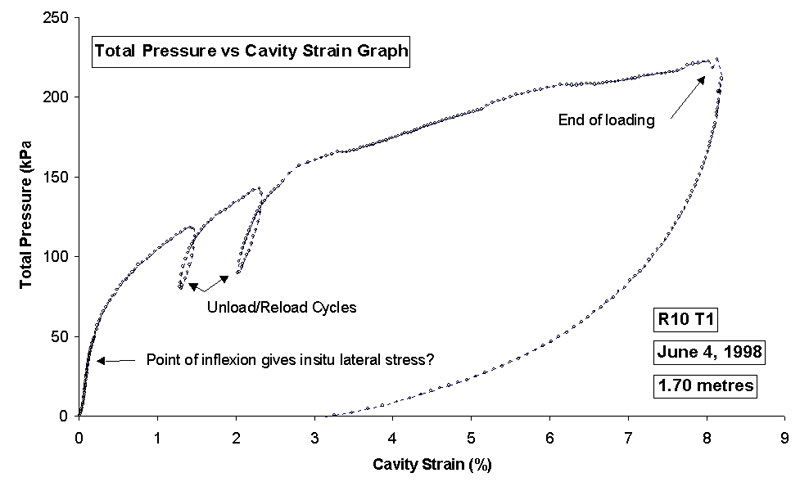 ISRM (1999): Suggested Method for complex stress-strain curve for intact rock on uniaxial compression. — Int. J. Rock, Mech. Min. Sci. & Geomech. Abstr. Vol. 36, pp. 279-289. ISSMFE (1994) Testing Method of Indurated Soils and Soft Rocks — Suggestions and Recommendations, ISSMFE Technical committee on Indurated Soils and Soft Rocks, pp. 65-69, 1994. KANY, M. (1997) Geocol — Colour charts, Beuth Verlag, Berlin. KRAEFT, U. 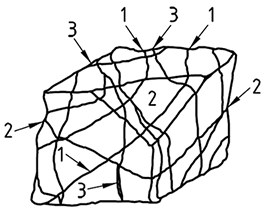 (1997): Classification of Rock and Minerals. Europ. Geologist, pp. 53-54. LE MAITRE (Ed. ), BATEMANN, P., DUDEK, J. et al. : A Classification of Igneous Rock and Glossary of Terms: Recommandations of the Union of Geological Sciences Subcommission on Systematics of Igneous Rock (1989): Blackwell Sci. Publ., Oxford. Figure shows the loading curve produced by a self boring pressuremeter in newly deposited waste. The test is relatively shallow, and the drilling was conducted from the surface through about 1 metre of capping clay.